Spending a day in a park surrounded by your loved ones with a wicker basket full of delicacies sounds quite an old school. But one can't deny the fact that there are only a few joys as greater as that of planning a perfect picnic. Picnics are proof enough that there's beauty in simplicity. It is an undemanding activity when executed creatively can be a lot of fun. Pulling off a perfect picnic also involves an ideal location. And Dehradun is no less when it comes to unwinding on fascinating foothills of Himalayas. Situated at 1400 ft, Dehradun is a place you can visit any time of the year to escape reality. Whether it's the natural scenic beauty, the bustling flea markets, luxurious resorts, or cafes serving mouthwatering cuisines, Dehradun never disappoints. To top this off, the city also houses unique and aesthetically pleasing whereabouts which you should visit for a pleasant picnic day. The experience of picnicking surrounded by wildlife is unmatched. Located only 15 km away from Dehradun city, Malsi Deer Park is where you will find herds of deer in their natural habitat. Apart from these majestic species, you will also come across Indian Antelopes, peacocks, two horned deer and flocks of birds filling up the sky vibrantly. The park sets a perfect backdrop to spend some quality time with your family, especially kids. Sight and click pictures of exotic wildlife, sip on refreshments and make the most of your day at this spectacular picnic location. True to its peculiar name, Robber's cave is essentially a river gushing through a cave-like formation. With a magnificent fort-like structure in the middle, the cave is 600 meters high and has a 10-meter fall, perfect to show off your Instagram feed. The water flow over here is as strange and supernature as it can get. One minute the water is flowing rapidly, the other minute it disappears underground, and then reappears a meter away. This beautiful tourist attraction is also a tranquil picnic spot. Plan a trip with your squad on the weekend to see the magic here for yourself. Looking for a day's outing in Dehradun? Search no more. 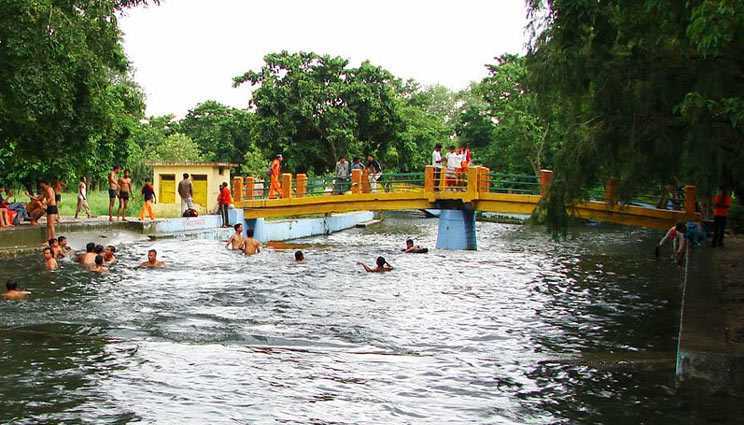 Located only 15lm away from the city, Lachhiwala is yet another widely known picnic spot in Dehradun. Surrounded by Sal trees in abundance, this park provides a peaceful and calm environment for picnickers. Spend a whole day admiring nature in its purest form, indulge in games and activities or dip into the human-made pools, and relish on delicious delicacies as the sun goes down. You are sure to take back a lot of memories. Sahastradhara is a mesmerising natural tourist spot open to the public. Located roughly 14 km from Dehradun, Sahastradhara packs a breathtaking spread of caves and waterfalls that are a treat for sore eyes. Wonderous waterfalls, an amusement park and a ropeway stretching over hundreds of meters with lush greenery in the background, one can't think of why Sahastradhara isn't the ideal picnic spot to spend a day with your fam. Entry fees: The amusement park and ropeway are chargeable. Although, sightseeing the waterfalls is free. Tapovan is a holy spot with a mix of nature. While devotees come in thousands to visit and worship their Gods and Goddesses, the area also witnesses picnickers in a significant amount. Located at a peak near to Dehradun city, people meditating in Tapovan reflect a calm aura. With the backdrop of the holy Ganga flowing and dense forests in the surroundings, Tapovan is the ideal picnic spot if you wish to get away from the hustle bustle of the city and spend some time detoxing in nature, near God. Developed only recently, Bhatta Falls is located 7 km away from Dehradun. A gentle and pure water stream flows down the hill here, untouched by commercialisation. While everyone can frolic in the freshwater ponds, there are swings and slopes especially for children in a nearby park. Make sure to pack a lot of food as there are no significant eateries in the area and also your camera to capture nature in its most beautiful form. Rich in history, the Johar Valley is undoubtedly one of the best trekking routes for adventurers out there. It is well connected to roads from all sides and tells a fascinating story of flourishing Indo-Tibetan trades that ended brutally after the 1962 Indo-China war. Strolling through this valley should be on every picnicker's bucket list because of its abandoned ghost villages, widespread landscape, breathtaking view of Nanda Devi. Fun 'N' Food Kingdom is the first ever amusement and water park of Dehradun. With 13 high tech thrilling rides, water rides, boating club, wave pool, rain dance, a kids pool and a lush green lawn with beautiful fountains to picnic at makes it the perfect picnic area. The park promises a day full of fun, best enjoyed with kids and adults alike. With ticket prices as low as INR 450, you are surely in for a treat. Instead of sitting on your couch and binge-watching this weekend, plan a picnic with your fam or squad at any of these spots to have an unforgettable experience, just like the old times. 7 Family Holiday Destinations To Travel With Your Kids To Ignite Their Wanderlust Early!